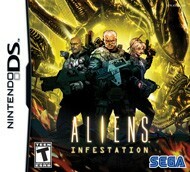 October 11th is almost here, along with one of the last potentially great DS games: Aliens: Infestation. Are you a fan of old-school 2D shooters and skull-puncturing aliens? set in the Aliens universe.